It’s the weekend; you are either in a post-altered state or wanting to be. Either way, this brunch will be easier to prepare than gathering pals, standing in line for a meal and chatting over crepes and coffee. All you’ll need is one pan. In your pan, get a dab of butter and melt, place a sliced English muffin on top until it gets nice and brown. Once done, place on a plate. If you’re in the mood for cheese, slice a piece and place on top of the English muffin—I used Pepper Jack. In your pan, heat up some olive oil on medium heat and sauté a chopped clove of garlic and add whatever vegetables you like. I use spinach, mushrooms and red pepper. Sauté everything until the spinach is slightly wilted and place on top of the cheese. Add salt and pepper accordingly. In your now hot pan, crack two eggs and cook over-easy. The key to making eggs such as these is timing. You don’t want to burn the bottoms, but you want to ensure that the base is solid enough for a good flip. Depending on how runny you like your eggs, this step should only take about two-three minutes. 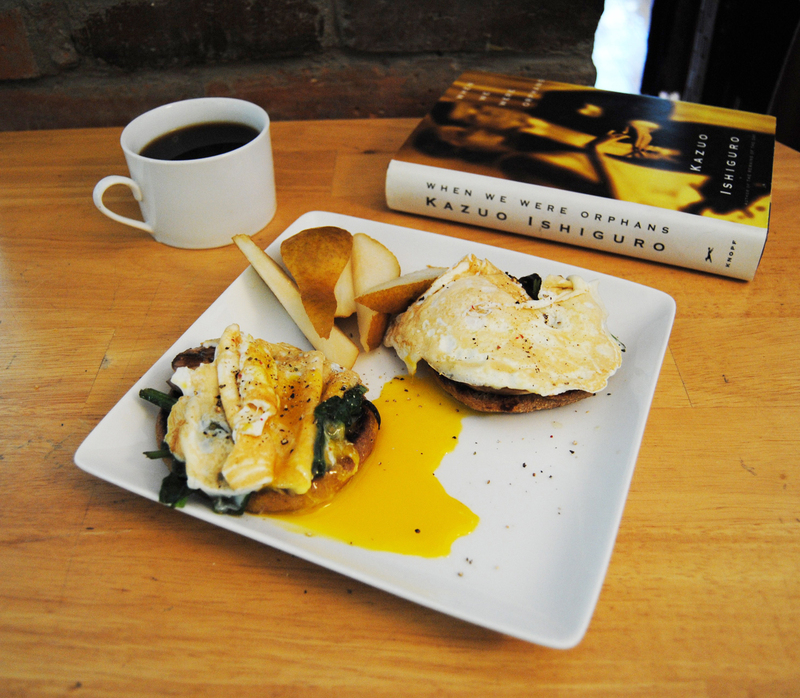 Then, place your eggs on top of your veggies on top of the cheese, which lays upon the English muffin that is on a plate. Voilà! You have made yourself a tasty brunch in the time it would take for you to have made a decision about where to dine. You can garnish with whatever fruit you have around. I had a nice Bartlett pear.